13th July. After our two weeks in St Denis, it is time to move on. Tim has kindly offered to drop us in Saintes, the start of our rail journey south. After a couple of hours we have arrived in Saintes, a Roman town some one hundred kilometers or so north of Bordeaux. 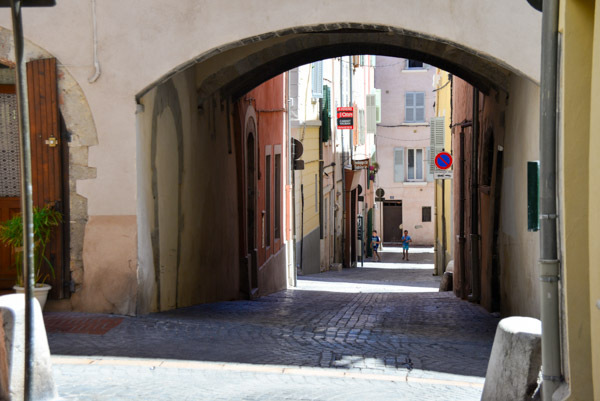 Bags have been dropped at the Hotel des Messageries, and we are off to explore the old city. Down to the river and the first thing we see is the ancient Roman arch on the far side of the river. Walking along the river we soon find the market in full swing in the square outside the imposing Saintes Cathedral. 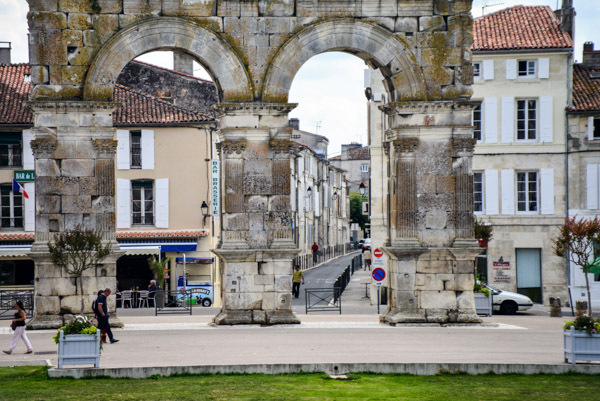 This Impressive Roman arch stands by the river in Saintes. 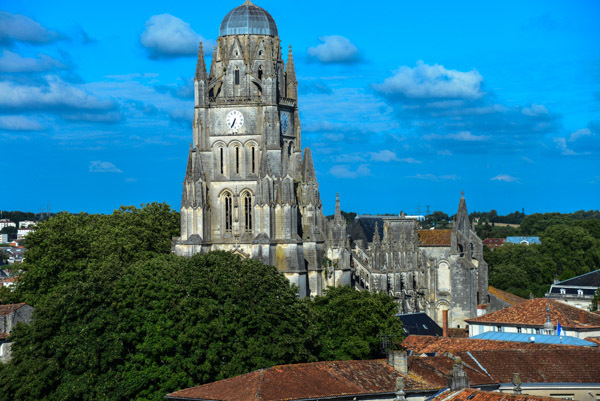 Saintes Cathedral in the afternoon light. 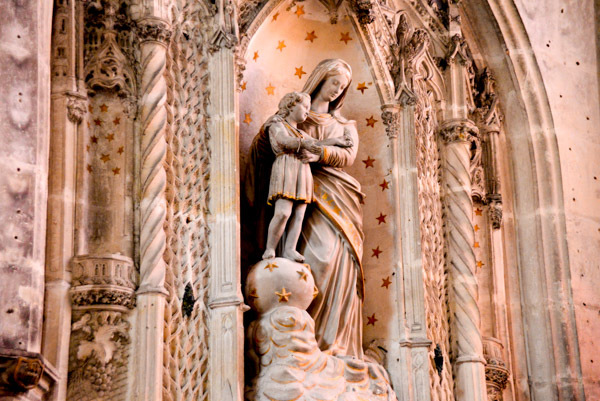 Mary is definitely the star of the show in most French churches both big and small. After a slow walk through the Cathedral and a wander through the narrow winding streets of the old city, we are now eating a last lunch with Tim before he makes his way back to the UK. We are enjoying the cafes in France; a gallette (savoury crepe) and coffee go down well before we part our ways and we return to the hotel to see if our room is ready. 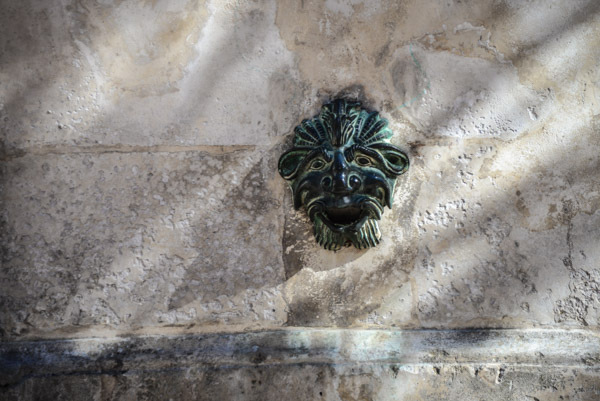 When booking a hotel in Saintes, I was surprised to discover that there were no vacancies anywhere near the Gare SNCF (main railway station) and now we discover why. 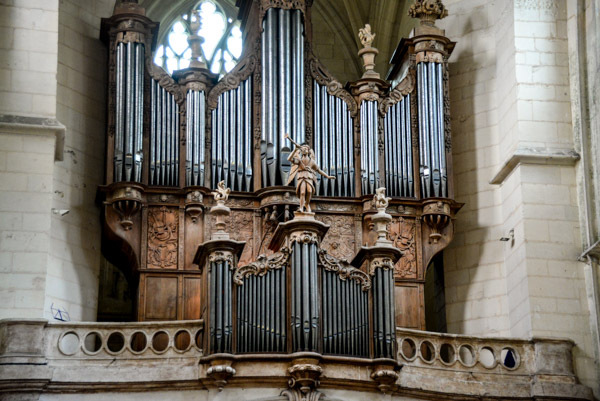 There seem to be two reasons; one … it is Bastille day tomorrow and two … Saintes doesn’t apear to have a taxi service, or at least not on a Sunday morning that coincides with Bastille day. I ask at the hotel reception if we can book a taxi to take us to the station for our early morning train, and after calling five different numbers the young receptionist has given up. And there is no bus either. Amazing! Now I know why the hotels near the station were booked up months ago. We had better check out the route to the station before having to drag our cases there in the morning. 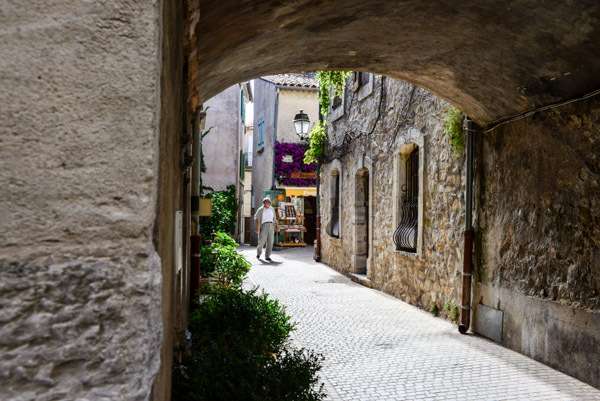 The town is our first French medieval town and it dates right back to the Romans. We enjoy wandering the old city and take in the view having walked up the hill behind the Cathedral. 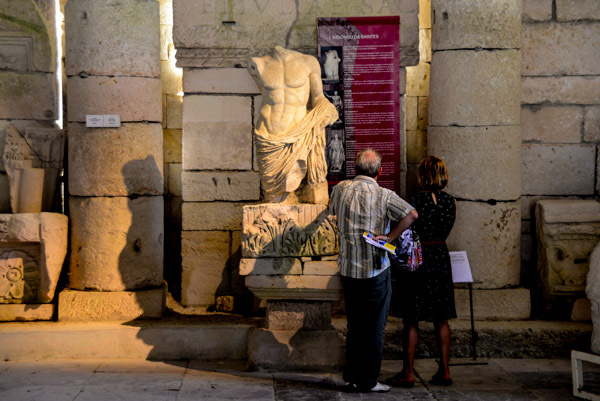 We visit the archeological museum full of bits of broken Roman buildings and statues (the latter having mostly lost their heads somewhere along the line). Abs to just die for! In the middle of the old city, we round a corner to find the source of the music we can hear. 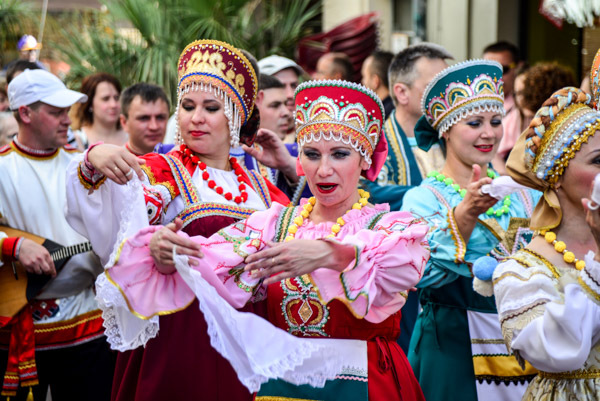 There, coming towards us, is a line of dancers in traditional dress (traditional to where we are not quite sure) followed by musicians, who did us the favour of giving a performance in the small square right in front of us. 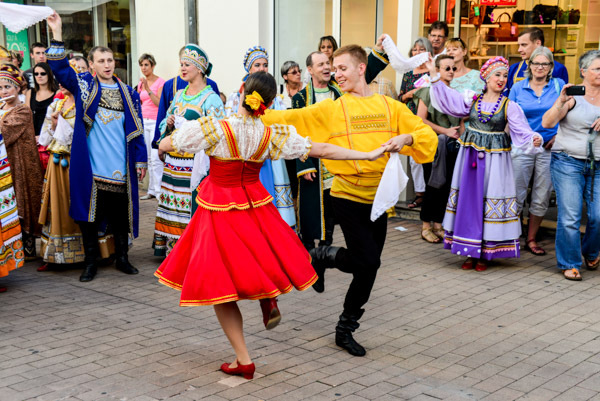 A crowd soon forms and the group sing and dance their way through the next twenty minutes before continuing on to their next performance destination. It seems that this is all part of the Festival of Saintes to accompany Bastille day. Street theatre at it’s best. Street theatre with the brightly costumed dancers from who knows where. They all looked and sounded so happy to be dancing in the streets. This one’s for Max … will he notice? 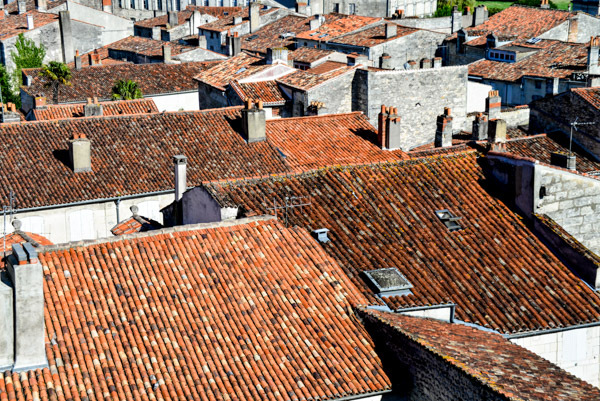 Just love these roofs in the old part of town. The hotel has no lift. We are on the second floor, and although the hotel staff were kind enough to carry our cases up to our room it is now time to carry them down again. They are heavy and the staircase is windy and narrow so I am happy that they are now sitting in reception while we eat our breakfast. Google says it is 1.4 km to the station and we set off through the deserted early morning to catch our train. We clickedy clack our way up the main street, through the Sunday produce market, where Jacqui is thoughtful enough to buy us some pastries for lunch on the train, and onto the station platform. Of course the train goes from the platform farthest away and after struggling down and up more stairs the train arrives and our journey begins. We enjoy the trains. They are comfortable and quiet. After a somewhat hectic change of trains at Bordeaux (with me, of course, going the wrong way down the platform in spite of Jacqui’s protestations) we find coach 15, seats 92 and 93 and settle down for the six hour journey ahead of us. After another change we are at Marseille airport where the real test begins. Find the car that is waiting for us! I find the parking station in Hall 1, and after showing documentation a large, heavy envelope is in my hands. Car identification papers – check; car keys – check; house keys – check; parking ticket – check; sketch map of where the car is parked – check. That seems to be all and so feeling somewhat tired, off we wander through car park P3 and find our steed for the next weeks of our stay in the south of France. The steering wheel is on the wrong side. I rue missing my chance to practice with this strange configuration whilst on the Island … on the other hand it was lovely of Tim to drive us around while he was there. It is an almost new Citroen DS4 … leather seats and all, and the letter left in the boot when we open it, asks me to be gentle with it. No pressure. No, of course no pressure! The car is an automatic; this fact seems, at least at first, to be in it’s favour. I don’t have to work a gearstick with the wrong hand as well. Out of the airport and onto the freeway and then through a very long tunnel going under a large portion of Marseille. We have emerged from this tunnel and there in front of us is our first peage … toll gate that is. Now, I consider myself to be reasonably technically minded, indeed I have worked with technology for most of my life in one form or another. Approaching the toll gates a slight feeling of unease sets in. Which of the several lanes to choose? The signs above each lane mean nothing really. Oh well … let’s try this one. Two euros eighty is the requested sum. Ah … here at least I am ahead of myself having put all my change into the small well in the centre console of the car. Requisit money in hand I drop the coins into the slot. Nothing happens. Perhaps the wrong slot? There is another slot, so I put some in there as well for good measure. I am feeling very uneasy, especially now the hoots from behind have begun. Suddenly a young woman appears wearing a hi-viz jacket to help. Phew! She undoes the back of the machine and looks inside … “You have broken my machine”, she says in perfect english. How did she know to use english … did I say something? Must have done. She pokes around in the machine and extracts the coins with some difficulty from the slot that is supposed to take a credit card. Ah, this is the answer … no coins on this machine, just credit cards … how silly does this supposed technical wizard look now! It ends with laughs all around as she hands over the excess coins and presses a button to let us through and with a somewhat red face, at last we are off once more. As with all motorways you don’t really see much of the passing country, so before we realise it, our exit appears; through another payage (the correct lane this time he said smugly) and we are suddenly in the country on truly terrifying roads. 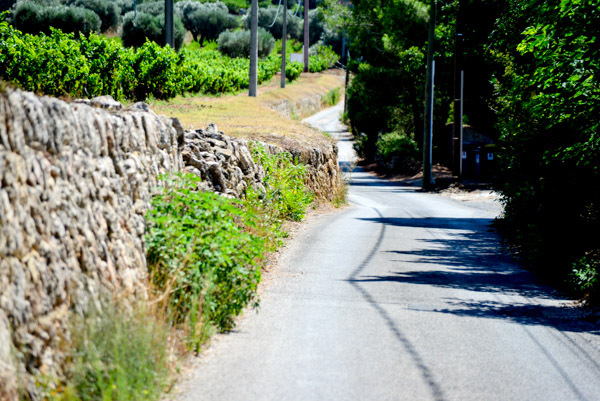 The roads in England were narrow enough, but these are more so, especially since the relatively soft hedges of England have been replaced by the very hard dry stone walls of southern France. And I am still on the wrong side of the car! It is with no small relief then that we turn into the gateway of the house, press the button to open the gates and roll to a stop inside. We have made it. The house is a small but very pleasant, set in what we suppose must have been farmland at some time, or maybe an olive orchard or vineyard. 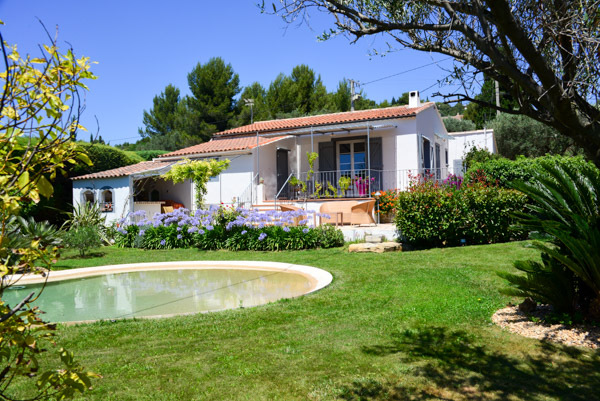 There is a sheltered terrace where we are to spend a great deal of our time looking out on to the small swimming pool (more a plunge pool really) and then across the valley to the pine clad hills dotted with houses beyond. Looks like a good place to spend the next month. Our two weeks on the Island has slowed us right down and now we set about perfecting the art. 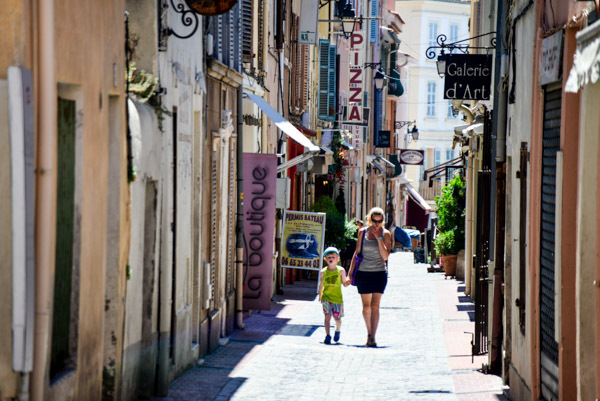 Unfortunately there is nowhere to get supplies within walking distance and so there is no alternative but to drive into Sanary-Sur-Mer on a regular basis. We have become addicted to fresh supplies of fruit, vegetables, bread and croissants. The town has a very good and inexpensive car park and I find the way there with the minimum of narrow roads choosing as many two way roads as I can. We park next to the ocean and walk along past the bathers on tiny patches of sand or on the rock breakwaters and walk around the corner for our first view of the harbour. It is beautiful. 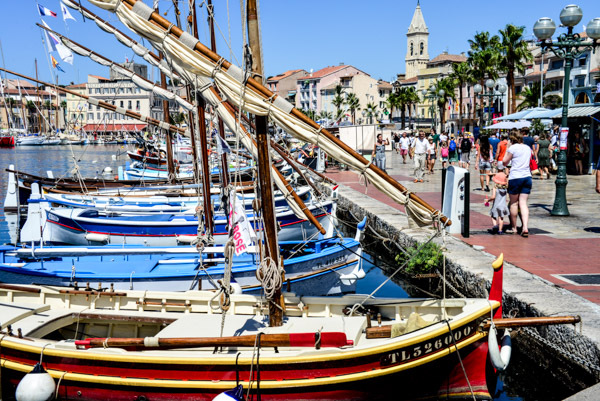 Full of boats of all shapes and sizes tied alongside the open plaza, with three and four story buildings rising behind all dressed in their best pinks, yellows and oranges with green and blue shutters and classic mediterranean roof tiles. 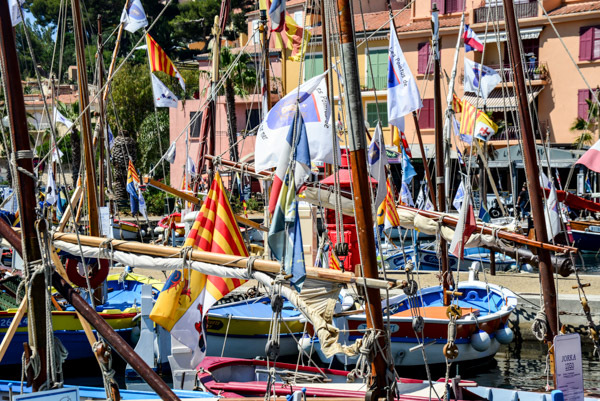 Awnings shade the tables and chairs of street cafes that spill across the pavements from where you can watch the passers by and the multitude of flags flying from the masts of the moored boats. It is something from a picture post card. We decide it’s just the thing. Narrow lane ways full of shops and restaurants radiate back from the plaza into the old part of the town. The tall buildings on either side provide shade from the heat of the sun and we wander hither and thither until the time comes to go to the market. The produce market is spread along the part of the plaza shaded by large plane trees and is in full swing when we get there. We buy vegetables, fruit, cheese … enough to keep us going and then to the boulangerie for bread and croissants for breakfast. Time to return for lunch and a swim in the pool. I think we might enjoy it here. This is Jacqui heaven … full of dress shops! 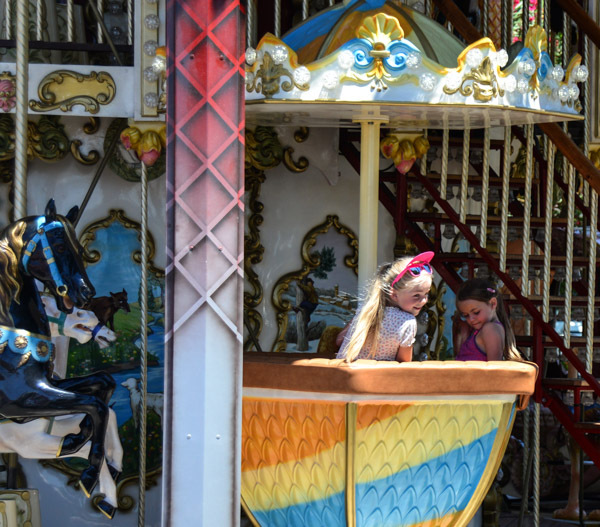 Every french town has a carousel … and all the french children love to use them. So … the Citroen is quite comfortable and smooth, but has one or two interesting characteristics. I mentioned earlier that it was useful having an automatic. So here we are approaching a roundabout. Lots of roundabouts here … no traffic lights. I like this because the French like to hide their traffic lights so that you only realise they are there when cars appear to be stopping for no reason. Anyway … approaching a roundabout talking myself through. “Don’t forget the traffic will be coming from the left and you go around the wrong way”. “Here comes a car but there is plenty of room so off we go”. It’s here that the fun begins. The Citroen surges forward and then remembers that it had better work out which gear it should be in and so stops. Yes … stops. In the middle of the roundabout with that car coming towards you. You stare at the car and press your foot harder on the accelerator, at which point the gearbox makes up it’s mind and you screech off down the road with heart pounding. I thought it was me at first, but after the second or third time I started to use the manual mode to preserve my sanity. The other interesting characteristic is the tendency of the brakes to be either on or off. Applying foot to brake you think that nothing much is happening; press a bit harder and you find your head rapidly approaching the windscreen in front of you and everyone else in the car giving grunts of surprise. I have to say that it does take a bit of getting used to. The medieval town of Le Castelette sits atop a hill inland from Sanary. It is more or less given over to pedestrians in the shape of the many tourists who visit, including ourselves. 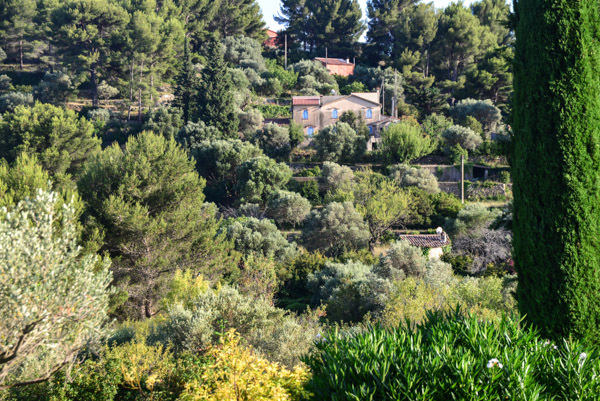 Like many small french towns, Le Castellette sits atop it’s hill. 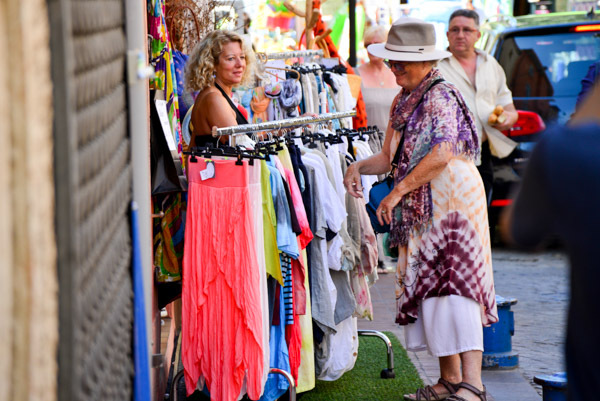 In many ways, Le Castelette has become a place for artisans with lots of locally produced things to buy. 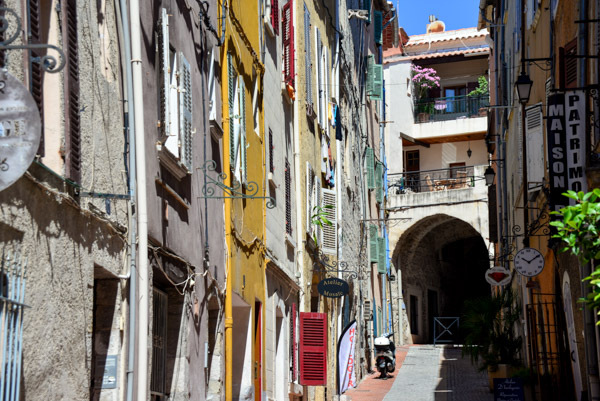 The rest of our time in Sanary blurs at the edges. 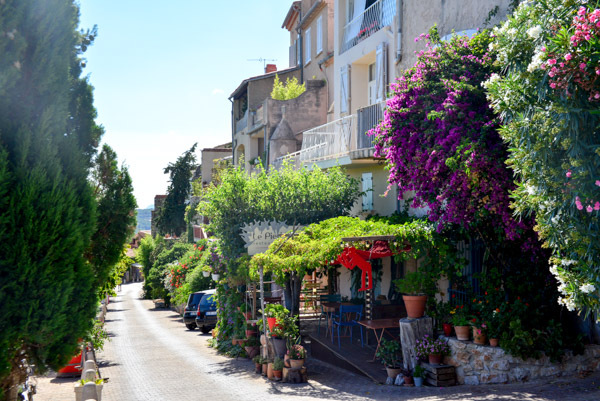 We visit the nearby towns of Ciotat and Bandol, take a tourist boat trip to view the Calanques; the amazing sea cliffs towards Marseille. 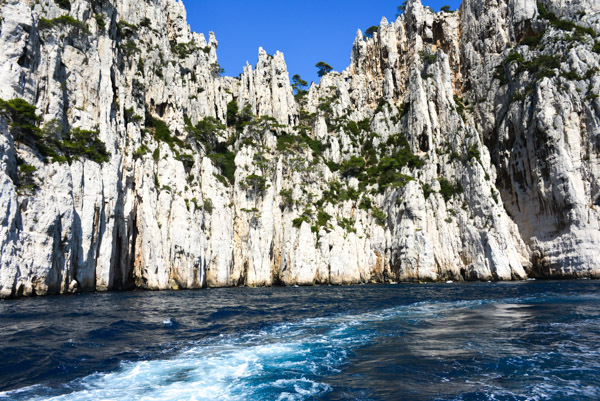 The name Calanques actually refers to the small gaps in the cliffs that give access to be able to swim. Here a colony of locals can be seen at play. 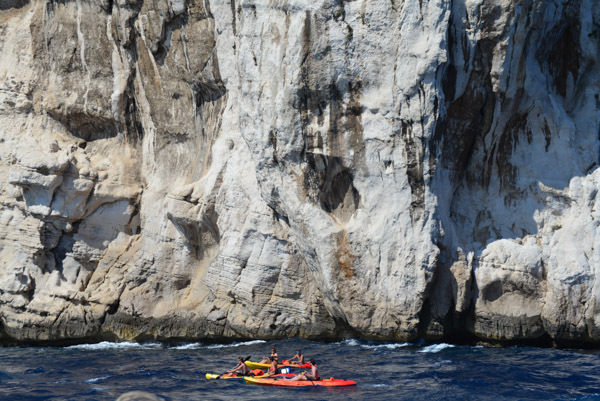 For the more adventurous among us there is always a sea kayak. There are a few visits to the beach for swimming. Jacqui’s sister Mary and Brian joined us for a week and Olly and Corrinne for another week. 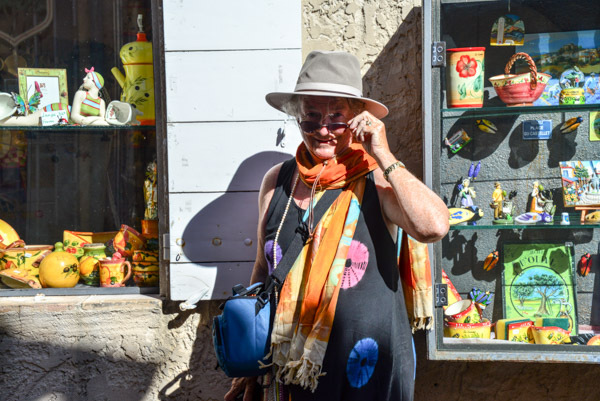 We also met up with nephew Kenny and Jude and visited the Grand Canyon of France – the Verdon Gorge. 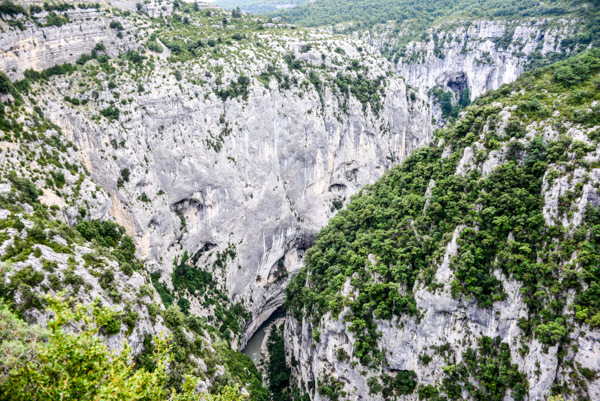 The grand canyon of France at Verdon. It was great to have some time to catch up with everyone and explore a few things together. A good time was had by all! 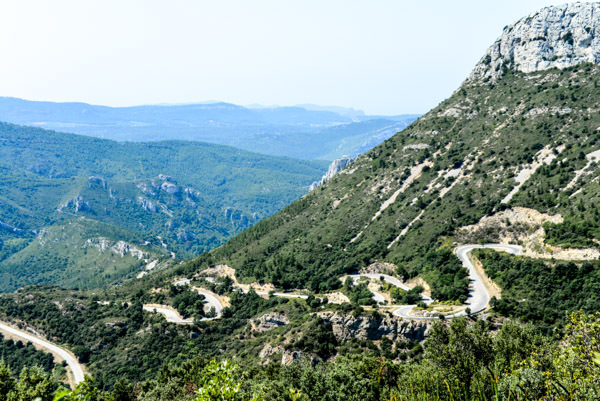 Altogether, the Cote d’azure gets a tick from us. 14th August. Now it is time to leave and fly to Barcelona for something completely different … a mediterranean cruise. But that for another day! Jacqui just loves those dress shops! 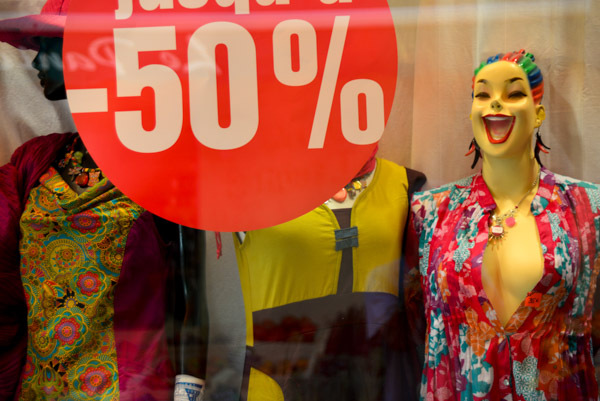 A new take on shop windows for the sales. Got a Ducati or a Porche? … this is the road for you! What a super time you appear to be having – very jealous! I wonder how much longer you have and we look forward to hearing more about you escapades. Hello both of you. It was great to spend time with you after all these years, especially in such beautiful surroundings. A lovely memory as we readjust to our life with muddy dogs in the fields of East Anglia. It did it again! Sardane! I burst out laughing at the reticence of the DS at the roundabouts and rejoiced that you ended up in such a lovely place. Have you had a chance to read the oeuvre of Marcel Pagnol? 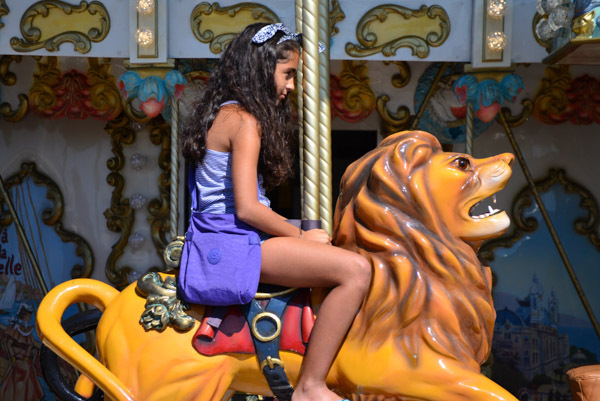 He wrote about his childhood spent in the “guarrigue”. 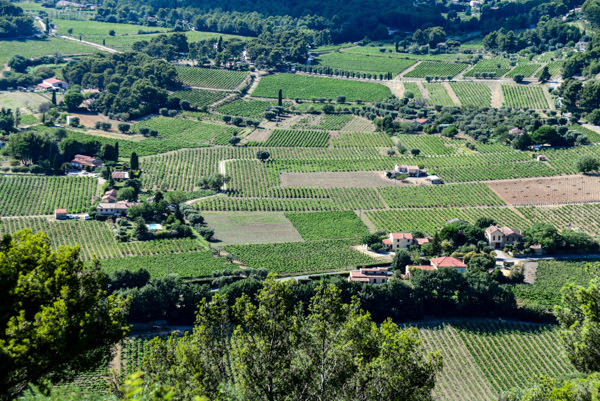 Also “Jean de Florette” and “Manon des Sources” are located in the very area you have just visited. They also come in subtitled videos. But you are now on the Ramblas, delighting in the spanish night life and eating real tapas and exploring the beautiful city of Barcelona. There too, the people start dancing the sardine in the streets, on Sunday, after Mass. I hope you happen to stumble onto that. Bon voyage, mes amis, à bientôt. Loved the photos especially of the street dancers. Perhaps Romanian? 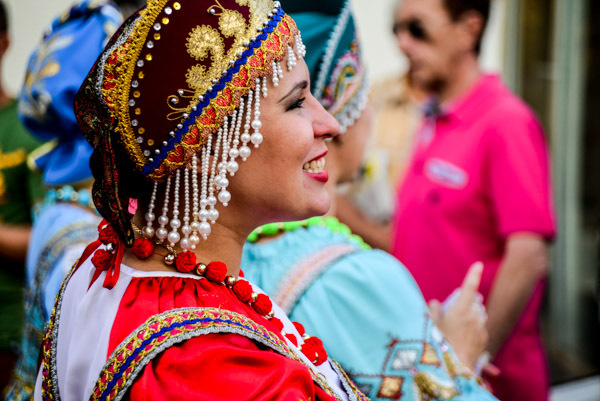 Isn’t is fantastic to see the huge mix of cultures around Europe and how they contribute to a potentially wonderful society? Yes, as usual, enjoyed this part of your trip with you. Hope you will invite us to your slideshow :). The other question is, how many bags will Jacqui arrive home with?